I noticed something today, while getting the final bits of my VAO setup ironed out. When I choose 'Run Lab Test' instead of actually running a failover plan, the report that is generated does not seem to use the template I have assigned to the plan. Instead, it is using the generic report template that comes packaged with the software and has none of my customizations. Feature, or bug? I would think that it should use the customized report for ALL reporting, not just the readiness and execution checks and for when you actually perform a real failover. Please let me know if there is maybe some other place to select a lab test template, or if I am missing something. What does your Template column look like under Reports -> name of your failover plan -> Reports? It indeed says that it is my 'Generic Template' (the one I cloned from the Veeam Default and updated). I open that Template in the Word editor, and it looks as I intend it to look. 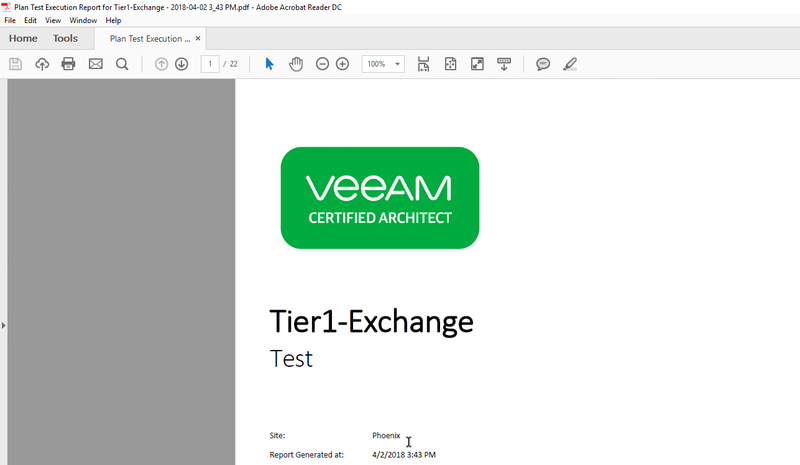 But all the reports appear as if they are using the Veeam Default Template. Same for other new jobs; one that I literally just set up 2 minutes ago and chose to use yet another template for, is using the Veeam default template. I have some screen shots, but have not had a moment to upload them and add them here. I will try to wok on this today. This is very strange, as it was working just fine up until the middle of this week. I figured it out. For whatever reason, even though a single template that is saved/generated for the VAO instance as a whole shows up in ALL SITES, the template for each site needs to be modified individually. For instance, I have two sites, DR and Production. I set up the DR site templates and enabled them in the configuration section. These templates become 'visible' on the Production site side of things and I used them for the Production site fail over plans, but any changes made to these DR templates do NOT have reflect in the templates I used. So, even though they are named the same, they are not the same template. This seems counter intuitive to me. If I set up a template one time and it's available across the whole systems, all changes to that template should be seen across the system. Does this make any sense? In my mind it's perfectly clear, haha, but I sometimes have a tendency to complicate things in how I communicate. Now the strange thing...I just cloned a template in my DR site and it does not appear in my Production site template list. WTH is happenening here!!!! I must have done something at some point to clone the templates in each site and just don't remember it. Nothing to see here, I guess.... Just me, forgetting what I am doing, apparently. Thanks for pointing me in the right direction, Rasmus! Regarding cloning - it does create a new, separate copy of the template. The idea is to allow a central template to be held on DR site; and then cloned to all Production sites, who can then further customize it themselves. In general we forbid 'cross-communication' between sites; we consider site as the boundary for these customizations (templates, scripts, credentials etc). Each site maintains it's own configuration. However we can look at the idea of 'Global Templates' as a feature for next version. Perhaps an option to Link templates across sites, so there is one source copy? Please let us know how your work with existing templates goes. Thanks! I think this is exactly what happened, except I didn’t realize that the clones were then individually managed. So, when I was running plans based on my DR site and templates, it all worked as planned because those were the templates I had customized. Using my Prod Site templates was where the issue was. A global template option would be great, I think, but I may change my view as I use this more and learn more about it.